Before 1492 it was assumed that all significant knowledge was already available; there was no concept of progress; people looked for understanding to the past not the future. This book argues that the discovery of America demonstrated that new knowledge was possible: indeed it introduced the very concept of ‘discovery’, and opened the way to the invention of science. The first crucial discovery was Tycho Brahe’s nova of 1572: proof that there could be change in the heavens. The telescope (1610) rendered the old astronomy obsolete. Torricelli’s experiment with the vacuum (1643) led directly to the triumph of the experimental method in the Royal Society of Boyle and Newton. By 1750 Newtonianism was being celebrated throughout Europe. The new science did not consist simply of new discoveries, or new methods. It relied on a new understanding of what knowledge might be, and with this came a new language: discovery, progress, facts, experiments, hypotheses, theories, laws of nature - almost all these terms existed before 1492, but their meanings were radically transformed so they became tools with which to think scientifically. We all now speak this language of science, which was invented during the Scientific Revolution. The new culture had its martyrs (Bruno, Galileo), its heroes (Kepler, Boyle), its propagandists (Voltaire, Diderot), and its patient labourers (Gilbert, Hooke). It led to a new rationalism, killing off alchemy, astrology, and belief in witchcraft. It led to the invention of the steam engine and to the first Industrial Revolution. 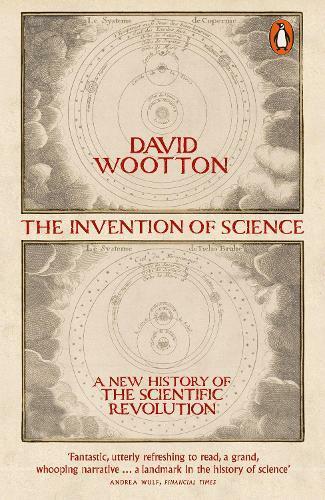 David Wootton’s landmark book changes our understanding of how this great transformation came about, and of what science is.